It's #SandwichWeek over here at ChefsFeed, and by god, it looks like there's something in the air—our pals at the James Beard Foundation released the secrets to the ultimate hot pastrami sandwich just when we needed it most. Read on, below. The hot pastrami sandwich at America's Classics winner Langer’s in L.A. is so good it has inspired fierce devotion among deli lovers, among them Nora Ephron, who wrote an homage to it in The New Yorker. The restaurant steams the well-spiced cured meat for hours before hand-cutting it into thick, tender slices. To make this popular variation, Langer’s layers the hot meat on twice-baked rye bread, still warm from the oven and slathered with Russian dressing, and tops it with Swiss cheese and a scoop of their sweet-and-sour coleslaw. Preheat the oven to 300°F. Wrap the bread in aluminum foil; bake for 10 to 12 minutes, until the bread is warmed through.Meanwhile, to steam the pastrami, bring a pot of water fitted with a steamer basket to a boil. Wrap the pastrami in aluminum foil and place in the basket; cover and allow to steam for 15 to 20 minutes, until all the slices are thoroughly heated.To assemble each sandwich, spread 1⁄2 tablespoon Russian dressing on one slice of warm rye bread. Add 1⁄2 pound of hot pastrami to the same slice, overlaying the Russian dressing. 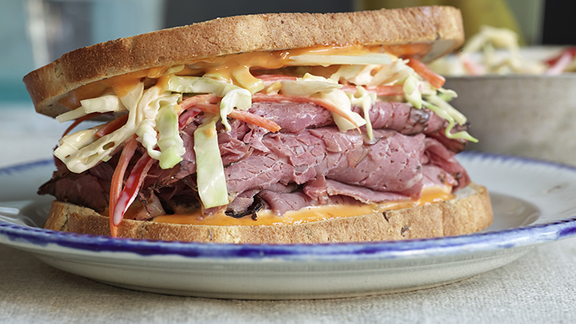 Top the hot pastrami with 1 slice of Swiss cheese and 1⁄4 cup coleslaw. Spread 1⁄2 tablespoon Russian dressing on another slice of rye bread and place it on the sandwich. Slice in half and serve.